Italy has four times more layers than France, despite its similar size. Italy's legal system takes about 1,210 days to resolve a commercial dispute, making it terrible for doing business. Italy has a backlog of civil lawsuits of about 5 million cases, increasing 10% a year. Italy has 240,000 lawyers, well over 4x more than France at 54,000. More than 1 in 10 members of the Italian parliament is a lawyer. 1. In the World Bank’s 2013 global ease of doing business survey, Italy ranked 160th out of 185 countries. 2. Italy’s justice system takes about 1,210 days to resolve a commercial dispute. 3. Italy has a backlog of civil lawsuits of about 5 million cases. That number is increasing by 10% a year. 4. 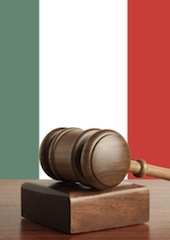 Italy has 240,000 lawyers – well over four times more than France at 54,000. 5. Lawyers also make up more than 10% of the members of Italy’s parliament.